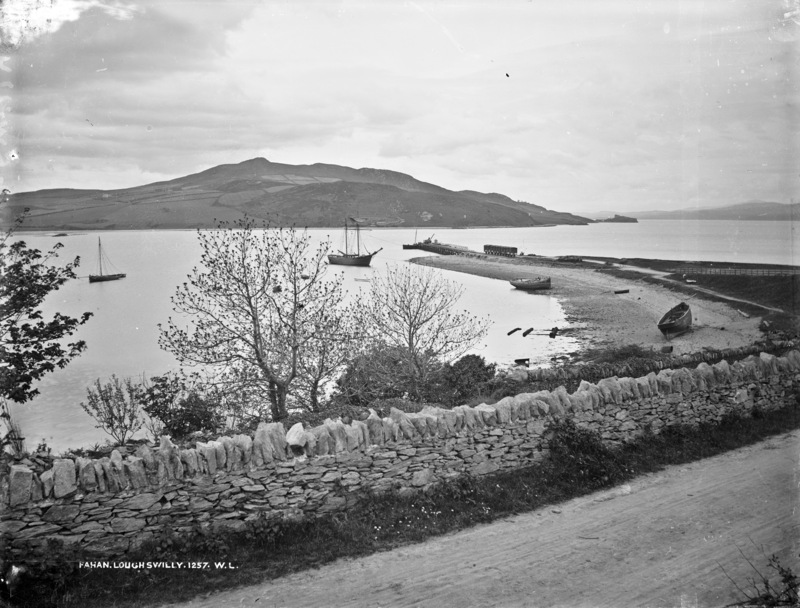 The pier at Fahan on Lough Swilly, Co. Donegal looks a lonely place in this beautiful Royal plate from the Lawrence Collection. Lough Swilly is famous for many things and one of the most famous is the kidnapping of Red Hugh O'Donnell there. If my memory holds good he was captured by a Carew and we visited the ancestral home of the Carew's earlier this week! This was one of several sidings in Ireland that used horse power. Streetview 25" map The railway dates from 1864, no help. The Line through Fahan opened in 09.09.1864, closing to passengers on 06.09.1948. Goods in 08.08.1953. Fahan, Fahan Junction and Fahan Pier. [https://www.flickr.com/photos/beachcomberaustralia] The Stereo Pair is good for dating: the Eblana collection is dated 1870-1890, but I think this actually means "probably 1880s". Is that a Dog near the end of the wooden fence?? L_ROY_03964 is a reverse view and is after 1875 from the buildings shown. The sailing ship Welcome is shown, but it is not the same as in today's, it is a real ship with three masts. apparently the railway station was the first to have electric light, see previous post.